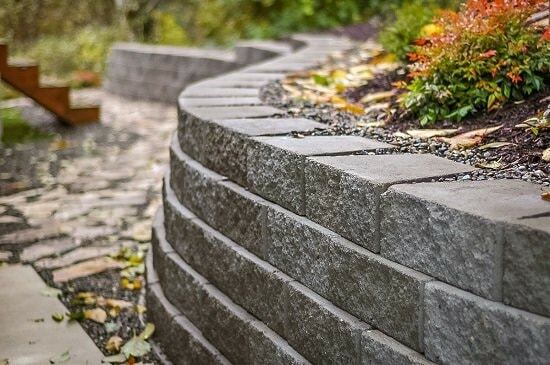 There are many retaining wall materials on the market and the material you choose to construct yours will affect its durability, longevity and appearance. While some retaining walls are installed purely for decorative purposes, most play an important role in the landscape by preventing soil from moving or eroding. Careful consideration is advised when selecting your material. The three retaining wall materials outlined below can be used to create straight, curved and serpentine retaining walls. One of the most common materials that we use is landscape block. Landscape block, made of precast concrete, comes in different colors and sizes, so homeowners have a variety of choices when it comes to picking the right landscape block for their project. One of the features that make this such a popular choice is the ease of installation with landscape block— installers are able to achieve evenly spaced blocks with little effort on their part. Landscape block is a sturdy, durable retaining wall material that can last a lifetime if the wall is installed correctly. This is the most cost effective material that we work with making it an attractive choice. Another material option is RomanStack Stone. The stone gets its distinctive look from a process that rounds out the edges and corners, providing texture to both sides while creating its stone-like appearance though it, too, is made from concrete. The stones are built with an interlock system that creates a strong, stable and more damage resistant wall. RomanStack Stone looks great from any angle. 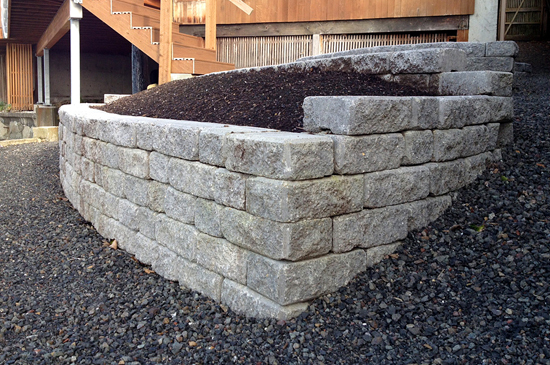 Basalt rock is one of the most popular retaining wall materials throughout the Pacific Northwest. Basalt is a dense, hard rock. When constructed properly, a basalt retaining wall is capable of withstanding a lot of weight and will last indefinitely. The stones come in different colors in a solid rectangular shape that conforms to stacked configuration, though the aesthetic of the finished product can vary depending upon the experience of the installer. Basalt retaining walls have a natural look that compliments flagstone, decorative rock and water features. Good drainage behind a retaining wall is vital to a long-lasting wall, no matter the material. We use drain rock and drain pipe to ensure that our retaining walls can withstand our region’s amount of annual rainfall. Proper drainage also reduces the amount of unwanted plant material and weeds that can grow in between the cracks of retaining walls. There is no shortage of options for homeowners who are looking to construct a retaining wall. 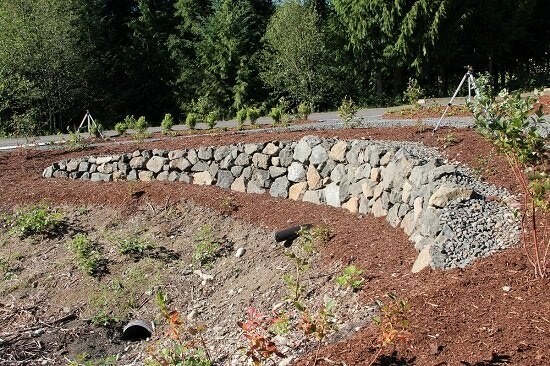 If you’re in the planning and budgeting stages and wondering which retaining wall material is right for your project, contact us at 360-697-3215 or 253-530-0788. We look forward to meeting with you! This 3-column water feature we constructed in Poulsbo is comprised of varying heights of columnar basalt. This elegant addition beautifully complements an already mature landscape. Turn up your sound and enjoy! 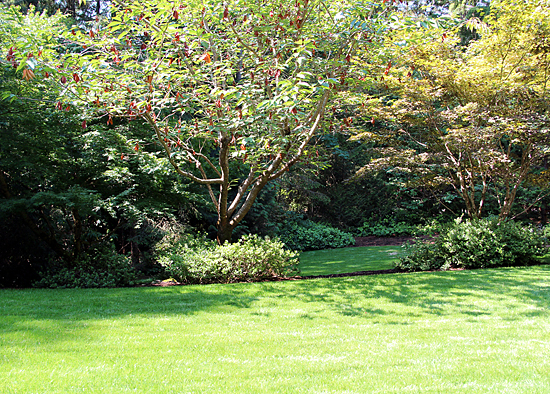 In late June we completed a lawn renovation and landscape clean-up for clients in Silverdale. Mom and Dad both work full-time, and the whole family is active in community theatre. With little free time to spare, the lawn was neglected, shrubs had overgrown, weeds had taken over the beds, and the irrigation system needed repairs. The lawn had already been aerated and de-thatched when this photo was taken. 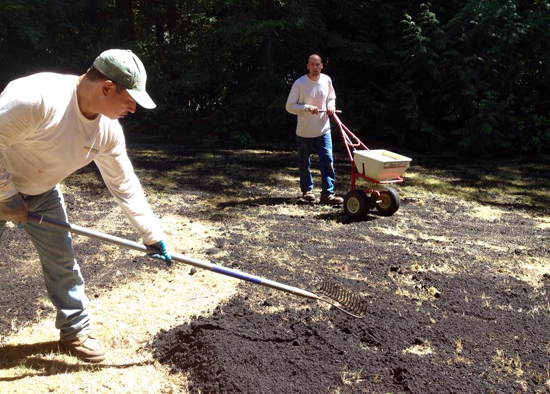 Juan spread a topdressing of compost while Josh applied grass seed. After the clean-up was complete, our first course of action to renovate the lawn was to aerate. Aeration, also known as core aeration, is the process of pulling up small plugs of underlying soil that had compacted over time. This creates a healthier root system because it allows proper circulation of air, water and nutrients to the soil below. Aerating results in better water and fertilizer absorption, key to a healthy lawn. This photo of the front yard lawn was taken only 3 weeks later. After aerating, the next step taken was to de-thatch the lawn. Thatch is a dense layer of dead grass and other organic material that accumulates over time and does not decompose. It sits atop the soil surface, smothering the grass, causing shallow roots and inhibiting growth. De-thatching, or thatching, with a power rake removes this dead layer of thatch between the grass base and native soil, and encourages lawn to spread by allowing for a better exchange of air, water and nutrients. The back yard lawn took longer to fill in due to less sunlight. This photo was taken 3 weeks after aeration, de-thatching, topdressing with compost, and overseeding. The lawn was now ready for a topdressing of organic compost, which we get from Vern’s Organic Topsoil. Topdressing is the practice of spreading a thin layer of compost over the lawn. Since we had already aerated and de-thatched, the compost was able to easily penetrate below the superficial layer and reach the native soil below. This is an important step in lawn renovation. Topdressing with compost enhances the quality of the soil by adding nutrients and improving soil structure. 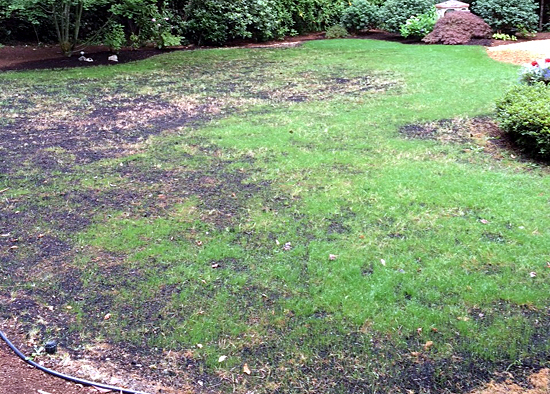 This photo of the back yard lawn was taken approximately 8 weeks after aeration, de-thatching, topdressing with compost and overseeding. 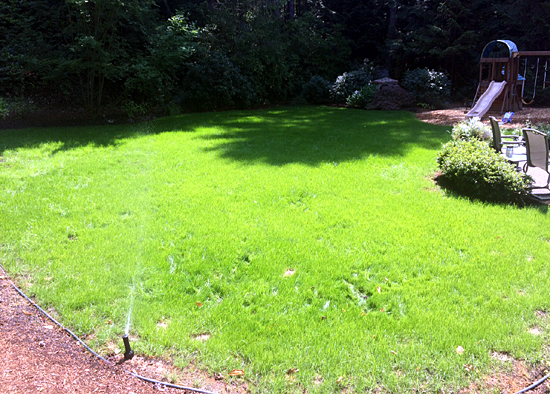 One of the final steps of this lawn renovation was to spread grass seed atop the compost, also known as overseeding. We use a grass mixture that is formulated specifically for the Pacific Northwest and a spreader to apply it evenly. 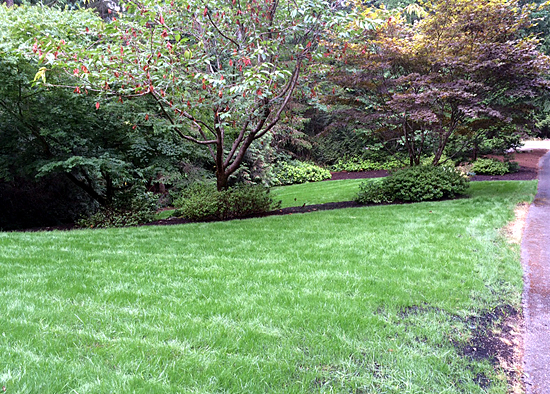 Overseeding reinvigorates a lawn by encouraging thick lawn growth. Bare or thin spots should always be overseeded to discourage weed growth. This photo of the front yard lawn was taken approximately 8 weeks after aeration, de-thatching, topdressing with compost and overseeding. With the help of a repaired irrigation system, the seed received sufficient water throughout the germination process, despite long stretches of 80-degree weather. Grass seed needs to be moist in order to germinate and grow, though you don’t want to drown seed in water. The photo above shows what the restored lawn looked like in August. After this summer’s record high temperatures and drought, your lawn could likely benefit from lawn renovation services. Give us a call at 360-697-3215 or 253-530-0788 for a free quote!